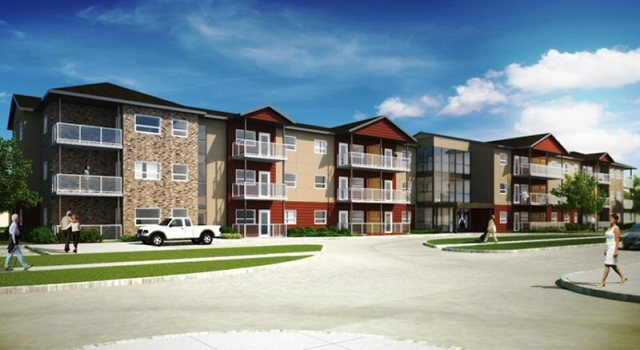 Construction is well underway on a new 48-unit affordable housing project, which will provide another option for Winnipeg seniors who are seeking a safe, convenient place to call home. The Honourable Mohinder Saran, Minister of Manitoba Housing and Community Development and Doug Eyolfson, Member of Parliament for Charleswood-St. James-Assiniboia-Headingley, on behalf of the Honourable Jean-Yves Duclos, Minister of Families, Children and Social Development and Minister Responsible for Canada Mortgage and Housing Corporation, announced funding for this project today. The project, called St. James Kiwanis Courts East (see photo), will include 25 one-bedroom units, 23 two-bedroom units, a residents' lounge and other common areas. It is the fourth phase of a multi-year development plan for the St. James Kiwanis Village seniors housing campus on Sinawik Bay. The estimated capital cost of the project is more than $11 million. The governments of Canada and Manitoba will provide nearly $2.9 million under the federal-provincial Investment in Affordable Housing (IAH) 2014-2019 extension agreement. St. James Kiwanis Courts Inc. (SJKCI) will provide more than $1.28 million in funding and land equity to this project. SJKCI was created in 1957 as a non-profit corporation, with the goal of creating and managing affordable seniors' housing. They currently operate several other seniors' housing projects in the same campus. The affordable housing rental rates for this project are $806 for a one-bedroom and $1,027 for a two-bedroom unit. SJKCI is expected to be eligible for up to $576,000 under Manitoba's Rental Housing Construction Tax Credit upon project completion. The new building is designed to be accessible. St. James Kiwanis Courts East is expected to open in late 2016. "We are honoured to continue building on the legacy of serving the housing needs of seniors established by the Kiwanis Club of St. James back in 1958 with the opening of our first housing project. Thank you to our government partners for supporting our Courts East project and for helping support our efforts to re-develop St. James Kiwanis Village to meet the current and future housing needs of seniors." - Hart Kapitoler, chair, St. James Kiwanis Courts Inc.
Canada Mortgage and Housing Corporation has been Canada's authority on housing for 70 years. To find out more about how the Government of Canada and CMHC help Canadians meet their housing needs, visit www.cmhc.ca or call 1-800-668-2642 FREE. The Manitoba government recently reached its five-year goal to provide funding commitments to create 1,500 new units of affordable housing throughout the province. The province is now working toward its new commitment to create another 500 affordable and 500 social housing units in the next three years. Manitoba Housing and community Development's overall strategy complements Budget 2015, a plan to create good jobs, grow the economy and protect front-line services by focusing on what matters most to Manitoba families. More information is available at www.gov.mb.ca/housing.